VCI paper packaging solutions. 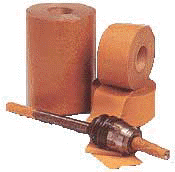 VCI paper corrosion protection for cast iron, steel and a variety of ferrous metals. VCI paper chips (emitters) provide an easy way to add corrosion protection to enclosed spaces or packages. VERSIL-PAK VCI WRAPPER is used in industrial & military corrosion protection applications including underground pipe corrosion control in combination with protective coatings. Versil-Pak's flexibility makes it easy to use over irregular surfaces. Grade 5 performs to military specification Mil B-121.